The United States says two of its service members were injured over the weekend, one each in Iraq and Syria. Pentagon spokesman Jeff Davis said on May 31 that the two soldiers “were not on the front lines, they were not engaged in active combat, but they were hit in both cases by indirect fire” — a term that typically refers to rocket or artillery fire. Davis added that the soldiers were carrying out advise-and-assist duties. He said the incident in Iraq took place near the northern city of Irbil, while the injury in Syria was north of the Islamic State (IS) stronghold of Raqqa. 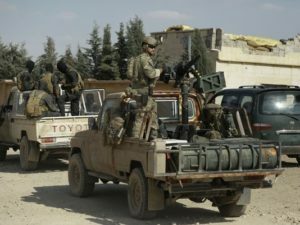 The United States has authorized some 4,000 troops in Iraq and 300 in Syria to help in the fight against the IS extremist group, which seized swathes of the two countries’ territories in 2014.